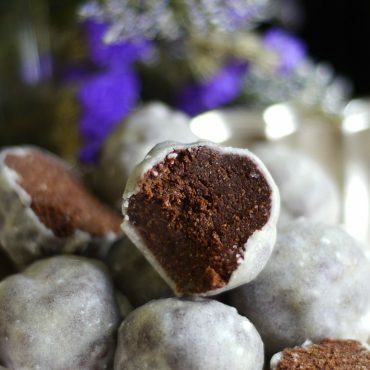 So if you follow the blog, you know I have fun with “free from everything” cakes, but this time I’m really excited to share this recipe with you because it’s so darn EASY. If you’re anything like me, sometimes you need cake but don’t have time to be doing ten layer masterpieces with exotic ingredients; heck sometimes you only have like ten spare minutes to make something good. 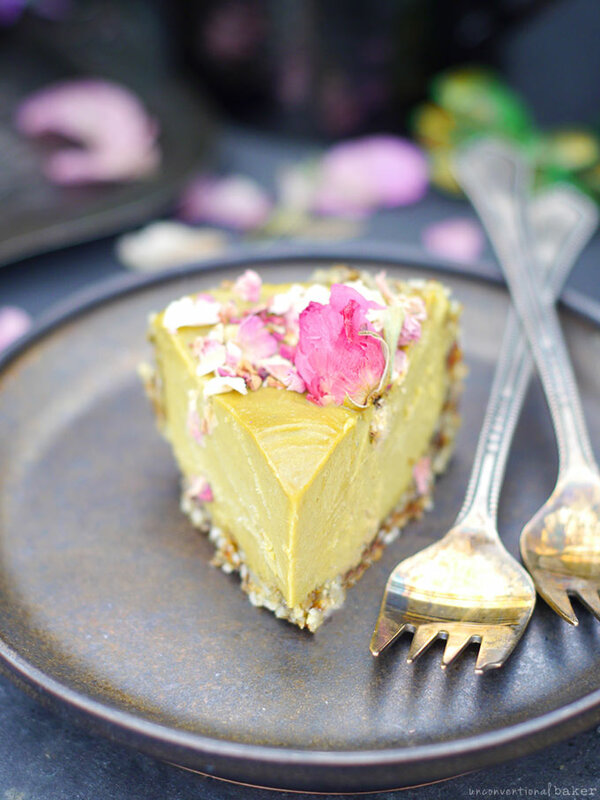 If you ever find yourself in such a situation, (and if you don’t want the heaviness of cashews or the oiliness of coconuts in your raw cake)…make this ASAP! And yep, this cake has got zero dairy, refined sugar, gluten or grains. In many of my experiments here a consistent problem I’ve been trying to solve is the iciness that comes with an oil-free cake. Coconut cream solved the problem sometimes, but it didn’t always work, and the requests I’ve been getting lately from many of you are for for coconut-free things anyways, so that idea was out. Turns out avocado is the perfect creamy medium for a healthy, wholesome, and delicious little treat. I made a few versions of avo cakes in many flavors (will share some of them soon), but decided to share this plain and basic one with you first because I really wanted to celebrate the avocado. Sure you can coat it with all kinds of flavors, drown it in chocolate, color it dark shades… but what’s wrong with an avocado-flavored treat for a change? This fruit (or veggie, depending on how you view it) packs the most incredible flavor, is a wholefood powerhouse, sports the prettiest mellow green shade, and is a breeze to work with. 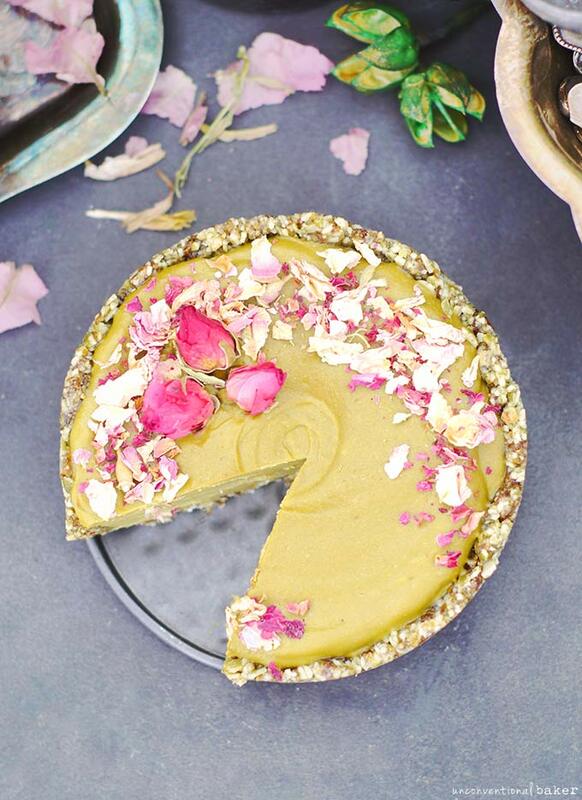 So I could have masked the flavor of it, disguised it’s color, and told you it’s a regular ol’ raw cheesecake, made the traditional way with cashews and coconut oil galore. Texture-wise, you wouldn’t know the difference. 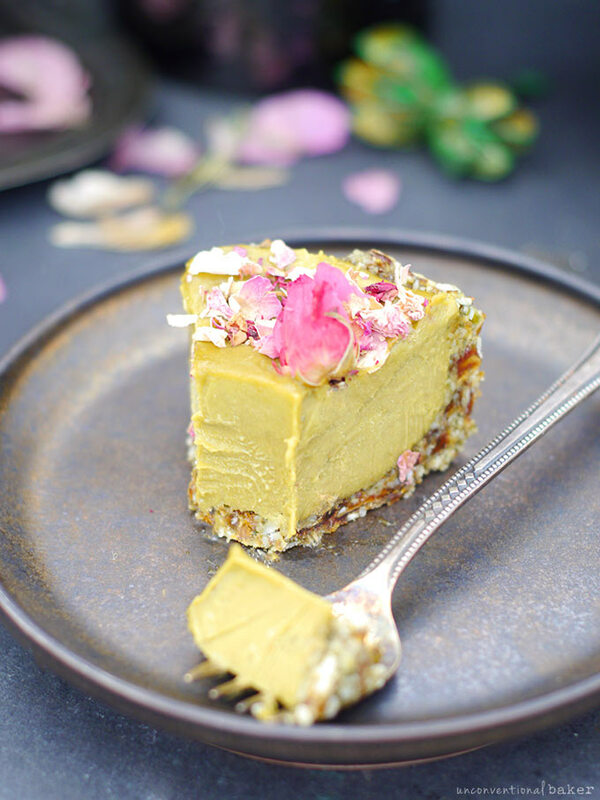 BUT I wanted you to experience the beauty of an avocado cake in the raw (no pun intended ;) ), appreciate its flavor to the fullest, and enjoy the thought of a creamy, dreamy, secretly veggie cake being so good. 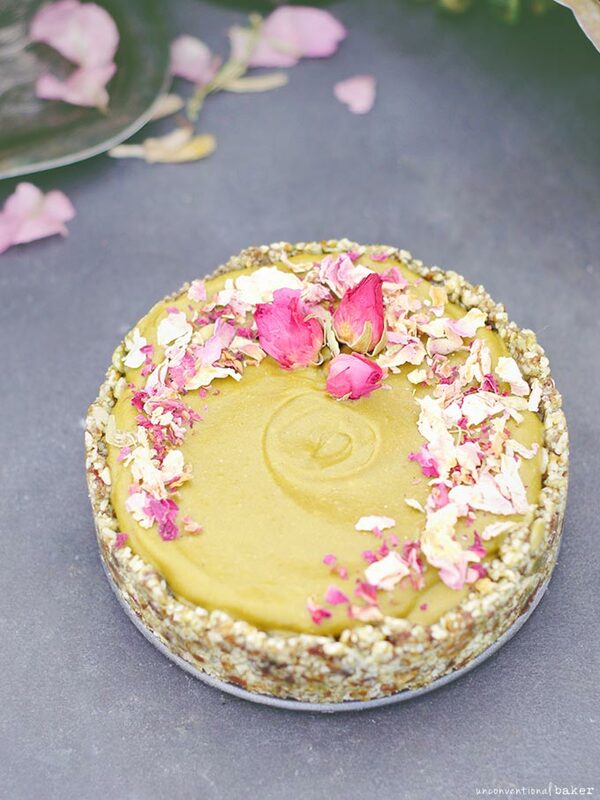 … And it definitely delivered once more when it came to making this super simple raw oil-free, nut-free, and coconut-free cake to satisfy those of you who’ve been asking for something like this! 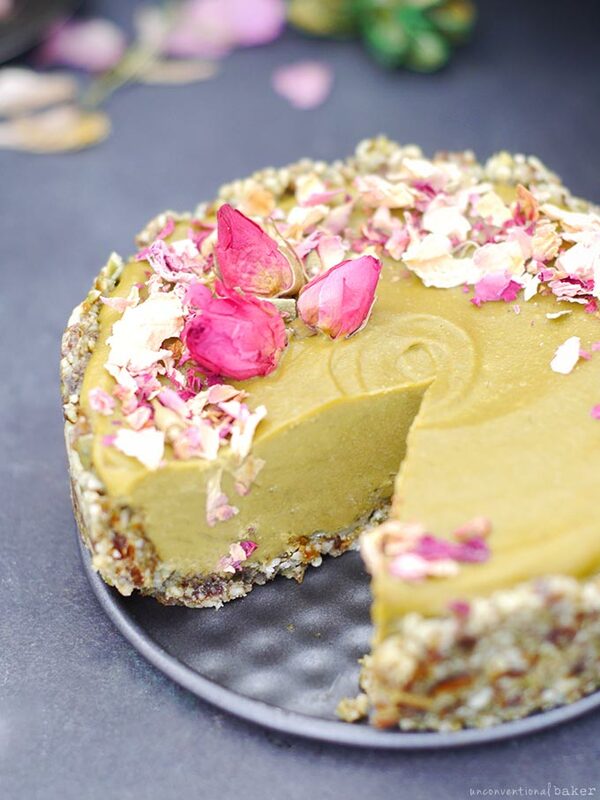 A creamy, grain-free, raw cake pairing sweet avocado filling with a pumpkin seed crust. 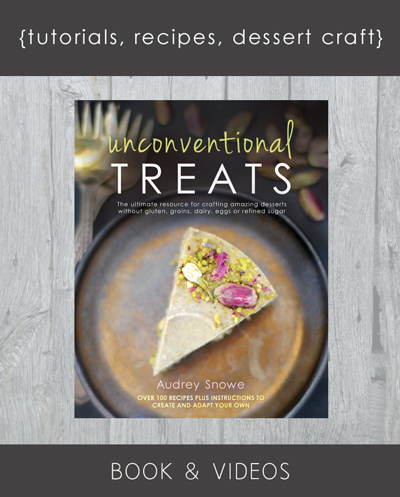 Gluten-free, nut-free, oil-free and vegan. Place all crust ingredients, except maple syrup, into a food processor and process into a crumble. Add maple syrup and process again into a sticky crumble. Transfer this mixture into a 5″ springform pan and press into a crust along the base and sides. Place in the freezer while working on the next step. Blend all filling ingredients in a high speed blender until a smooth mixture forms (you may need to pause and scrape down the sides, or use your Vitamix tamper). Transfer the mixture into your prepared crust shell. Carefully smooth out the top to even it out. 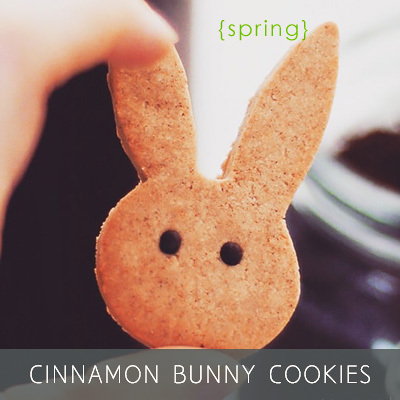 Sprinkle with any decorative toppings. Freeze for 4-5 hours or overnight. Enjoy! Keep leftovers frozen. 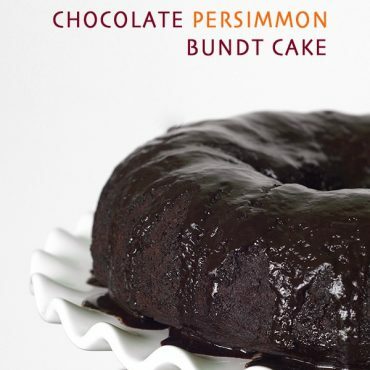 This recipe makes a small 5″ cake. Triple for a taller 6″ pan. Disclaimer: this recipe contains affiliate links to the 6″ and 5″ pans I use, as well as to the rose buds I used to top this cake. Made this for my birthday 🎂 It was like a present from me to me because i loveeee avocados 🥑 Thank you fir sharing the recipe! My family, including my 2 kids enjoyed it as much as me! This yummy green colour remains the same in next days? Hi Chorafa — yes, the color will remain the same so long as you keep the cake frozen and contained. The freezing process + the lemon juice in the cake will keep it from going brown. First, how do you think it would be if I skipped the whole crust part? I don’t think she could eat it anyway. Would it fall apart? Also, I’m going to leave out the coconut sugar and just rely on the maple syrup for sweetening. Do you recommend using more than 4 tbsp if I do that? I don’t want it be crazy sweet anyway. And lastly, maybe a silly question, but how do you store this in the freezer? Bag, container? And do you need to let it thaw for any amount of time before eating? Hi Kayla. The crust basically helps to hold the cake together more easily, and also just gives a good crunch-to-smoothness balance. You can definitely skip though, but in that case I’d recommend adding a few tbsp coconut oil so that the cake consistency is firmer — especially if you also skip the coconut sugar (since maple is more liquid). You can always taste the batter to determine if it’s sweet enough to adjust the maple amount. I usually put mine inside a tupperware container (sometimes I flip the container upside down first and place the cake pan on the inside of the lid and cover with the dome — so it acts like an impromptu cake carrier, if that makes sense). This cake doesn’t need long to thaw out — just a few minutes. It’s soft enough for slicing pretty much right off the bat. I’ve just made this, but I can’t understand how these quantities make for a 5 inch pan or what I was doing wrong. I had to double the quantities for this pan and even add some banana, since 1 of the avocados was spoilt. Also I couldn’t use the crust for the sides as well, again because of the little quantity that resulted after mixing. But then again, it’s probably me and baking (usually a no-no). Curious about the result, it’s in the freezer now. Hi Mila. Hm… I’m not quite sure why the quantities didn’t work for you. I’m not clear — did you use a 5″ pan for yours or were you trying to double the quantities for a larger pan? I use this pan and never have trouble. I suspect swapping the banana for the avocado would work, but would also make the cake a bit more “icy” than creamy. How did it work out? Hi! I actually doubled the quantities for the 5″ pan. I live in Europe, I work with cm & grams, etc, so maybe I made some mistake when converting, although I am pretty used to all measurement equivalents . It might also be the avocado quality, I wasn’t pleased with them, but there was no time for replacement, hence the adding of the banana. And yes, it ended up with an “icy” feel & tastes like a popsicle! It’s ok though, we like it. Thank you so much Audrey for this beauty…my sister keeps saying how amazing Advocado is in smoothies so I thought I’d make her this for her birthday it looks beautiful and from my taste testing tastes pretty good too! I usually go the avocado and chocolate route with desserts because we’re not actually the biggest fans of avocado alone. I know we’re like the only ones, right? But, since it’s so healthy and really does give such a nice creaminess I try to sneak it in where it won’t be noticed. None the less this cake looks very tempting and so beautifully decorated! Love it Audrey! Looks like a delicious nut-free recipe. I haven’t made a ton of desserts using avocado, but LOVE the creaminess it gives so I’m imagining this cake is awesome! Yes, creaminess galore. I make a lot of avo desserts, but liked it in isolation here. Really nice, and a wonderful nut-free option for a treat. Beautiful recipe, and love that it’s simple but so nutritious! Thanks Natalia :) I love the simplicity of it as well. This cake looks INCREDIBLE, Audrey! 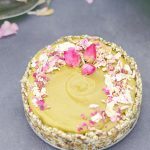 I’ve never tried an avocado cake before, but I HAVE tried avocado pudding and loved it! I appreciate that you kept it really simple and didn’t cover up the fruit/veggie-ness with chocolate, which is where my mind would’ve jumped first. 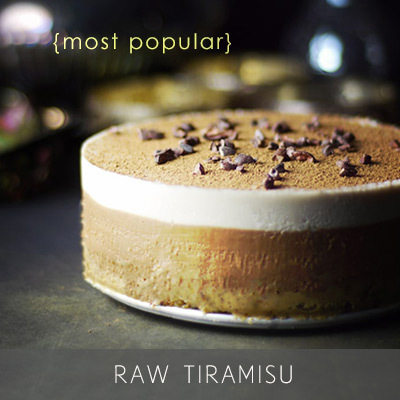 Avocado is having it’s special raw cake superstar in the spotlight moment! This is another one of those times though where I’m not sure I can even imagine what sweet avocado cream filling will taste like, I’m very curious now. I do love how easy this is too! 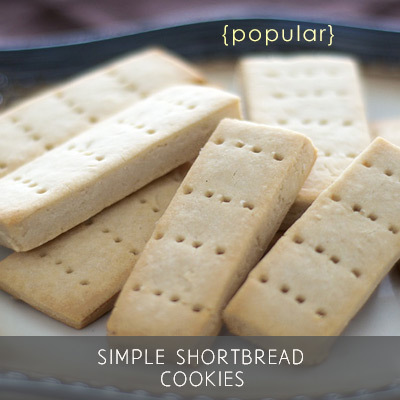 When pushed into a corner with all sorts of ingredient limitations you always come back with something so simple but genius! How fantastic. 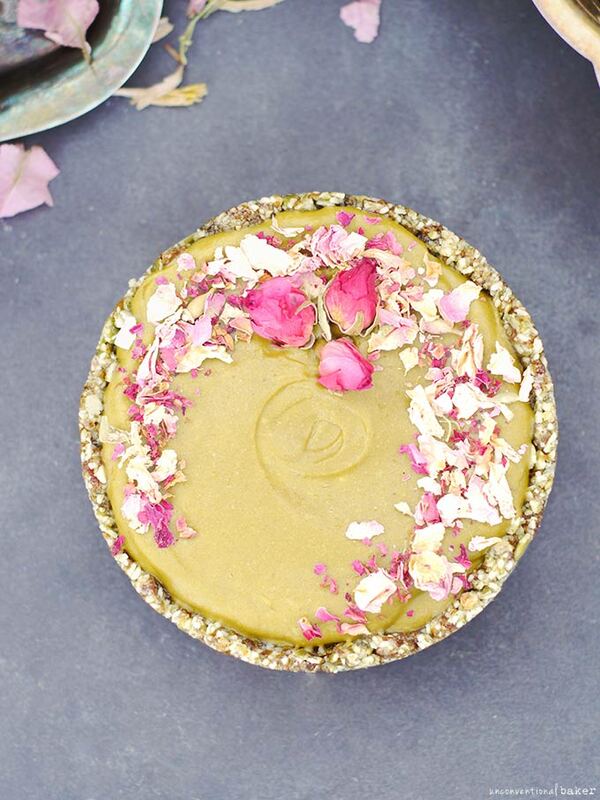 I’ve tried and loved chocolate avocado desserts but never had a ‘plain’ avocado dessert before. I have to try this!